Circular aperture with adhesive area. Non-linting, tear-resistant, waxy paper release liner. Thin, soft, drapeable, low-glare matte-finish film. Sterile. 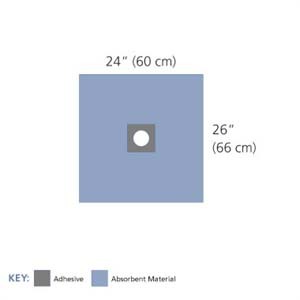 2.5” circular aperture with an adhesive area that measures 4.5” x 5”. Drape measures 24” x 26”. Great for minor procedures. Sold 25 per box. 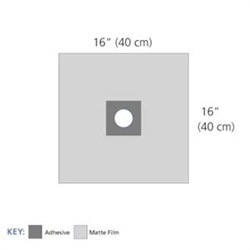 Aperture drape measuring 16" x 16" with 2.5" circular aperture and 5" x 5" adhesive area. Sold 10 per box.